When we choose to live more consciously, we benefit not only ourselves but all of life. In these turbulent times of transition and healing, women in particular are being called to reevaluate their lives and redirect their passion and actions toward purpose and meaning. By consciously redesigning our lives, we can reclaim our life force, connect more deeply with Nature and all life, and bring positive change to the world around us. Thus we become the true sovereign of our lives. Life Design for Women engages you in a simple, reflective visioning process to help you redesign your life to be more satisfying, meaningful, and aligned with your goals. Step by step, you will examine your life as it is, the influences of your past, and the future you envision for yourself. You will survey the domains of your life--from how you create “home” to your relationships with loved ones, food, your body, the Earth, and even Death. 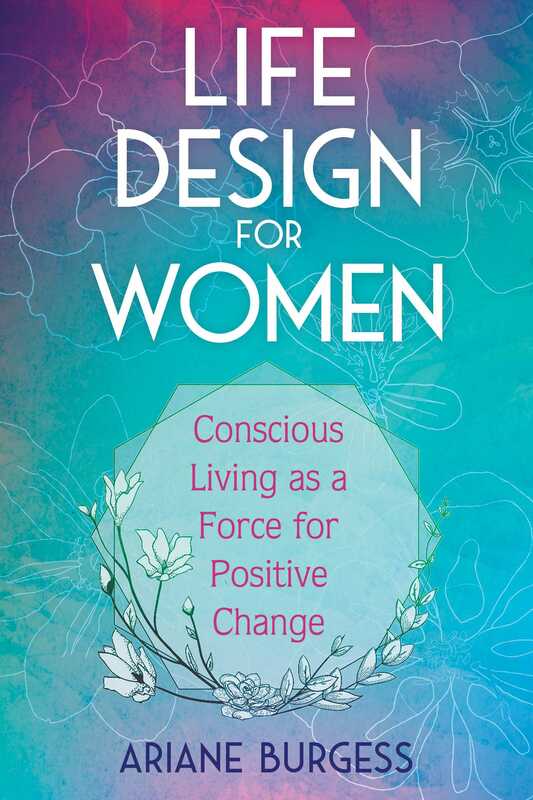 Applying the regenerative principles of sustainability to life design, author Ariane Burgess provides reflective exercises and practical tools to help you examine each of these domains, engage with natural systems, honor the feminine life force, and design your future. She shows how deep work in these areas gives you the resources needed to cut ties with the past and redirect your energy and passion toward your authentic purpose. You will learn to consciously weed out the thoughts and activities that get in the way of your resonant heart, take full responsibility for being the creator of your experiences, and make decisions that nurture your authentic self, rather than living your life through the dreams and fears of others. With this hands-on guide, you can reclaim your power through the Life Design process and choose to live more consciously. Gaining clarity on how you want to be, you bring well-being into your life and become a force for positive change, contributing to a thriving, regenerative future for life on Earth. The Life Design process is about making changes in your life, small ones and large ones. It’s about all of us changing our lives to consciously live in service to nature and all of life. Everything in nature is constantly changing and as we’re a part of nature, we need to get unstuck and align ourselves with this truth. Making changes can be scary; change invites the unknown as well as possible risk into our lives. What if the change we make won’t be better than what we have now? What if I change and I feel pain or even die? The thing is that if we don't change, in the long-run nothing will be better. Our fear of change can get us into life-diminishing ruts in which we wile away our lives. The current world situation demands we get out of that rut and engage with Life. The changes we need to make must be conscious, strategic, and have a lasting impact. To ensure that we aren’t making random guesses about what we might change, the Life Design process will help us focus on key areas of our life and create a more profound change. In this process, you will recover your life-force and become sovereign of your life. You will become nature’s ally rather than its enemy. The process involves unlearning the conditioning you took on at various stages in your life. You are the one who gets to choose what and how to change. This involves unlearning old ways of doing things, so there will be room enough for you to learn new ways. Life Design is a three-step journaling process that guides you to examine your worldview and values in critical areas in your life--what I call “domains.” You use the open-sentence prompts to explore the various areas of your life to determine where you can make changes. The three Life Design steps you work through for each domain are: Observe, Design, and Act. In Observation you will look at your domains in two ways: Reflect and Envision. You will Reflect on your present way of living in a particular domain, and on your past. Then you will Envision your desired future, the life you will live as your Sovereign Self in that domain. Reflection is an essential part of the Life Design process. It creates the dynamic tension between how our lives are now and the future sense of self. Reflection gives us the opportunity to see what's really going on in our lives, to look at where we're on track and where we're off. Reflection also gives us the spaciousness to step back from the desired future outcome we think we want and go a bit deeper - is that really it? Or is that the worldview of an old self that’s fueling the desire? Reflection is your Life Design feedback loop. You see where you are now, you make a change, live into it and reflect - how is this? How do you feel? What do you notice? When you Envision your future, your Sovereign Self, you write about how you imagine you will feel, what you will do and have, and where you will be when you are living the change in that particular domain. Through this process, you are energizing your future self and creating a picture of what you want to become. If you like, you can create a vision board. Once you’ve completed the Observation step for a particular domain, you move on to Design. In this step, you will gather all the ideas you have for taking action in this domain. Then you will hone in on one activity and make a proposal for change. You will define what you will be doing, why you are doing it, where, when, how and who with. You will Map for Action to identify the optimal time in the coming six to twelve months to begin your change process. To help you keep going, you will also identify your support networks and the ways you are going to track your change. The next step is to Act. In this step, you are actually living the change. The change is made up of daily habits and practices. Tracking is a great way to monitor if you are actually implementing the new habit or pattern as much as you had planned to. In the Design, you may have planned to stop eating meat for 30 days. Tracking what you actually do can help you see yourself more clearly. Once a habit becomes embodied, you just do it without trying and don’t need to track it anymore. I don’t track the days I smoke a cigarette because I don't smoke. I do track the water I drink because I tend not to drink enough and I know that when I do drink water, my internal body functions can do an optimal job - I have fewer aches and pains, can think more clearly and have more energy. Tracking how much I hydrate myself helps me see the correlation between my water intake and my physical wellbeing and I can see if the amount I think I drink and what I actually drink are aligned. Journaling is the core practice in Life Design. The writing process invites the relationship with your inner and outer selves to develop. When you journal, you are journaling for you; this is your process of discovery. You will find that ideas and thoughts will come up for you. You may even find yourself writing things that at first don't make sense. It's essential to set your inner critic and self-censor aside when you do this work. The process and your journaling are not done for anyone else, so don’t worry about it making sense for anyone but you. Do make sure you can read your handwriting as you will be referring back to what you write. Ariane Burgess is a regenerative designer. She is constantly designing and implementing regenerative projects, which include the Labyrinth for Contemplation in Battery Park, New York, and the Findhorn Food Forest in Scotland. She is passionate about facilitating transformative learning spaces for people who want to embrace regenerative design as a response to the crisis points currently converging on Earth. She lives in the Findhorn community, Scotland.